Donald J. Trump ran on a commitment to “drain” the D.C. swamp, and by all accounts, he has been successful so far. On Monday, FBI Deputy Director Andrew McCabe, who was implicated last year in a suspected plot to undermine Trump’s campaign and presidency, abruptly resigned — or was fired — just a day after FBI Director Christopher Wray went to the White House to read a four-page “FISA memo” authored by the House Intelligence Committee. The memo, according to various reports, allegedly contains documentation of FBI and Justice Department abuses of the Foreign Intelligence Surveillance Court during the Obama administration. Specifically, the memo may well indicate that McCabe and others were involved in an “insurance policy” conspiracy aimed at using a bogus opposition research document — the infamous “Trump-Russia dossier” — to obtain a FISA court surveillance warrant used to spy on the Trump campaign. In December, reports implicated McCabe as a potential co-conspirator along with anti-Trump FBI counterintelligence agent Peter Strzok and his mistress, FBI lawyer Lisa Page. As yet no one from the FBI has explained, at least publicly, what was meant by “insurance policy,” nor do we know what exactly Strzok, Page, and McCabe had in mind to either prevent Trump from becoming president (which happened anyway) or undermine him once he took office (which has also happened). That used to be treasonous. 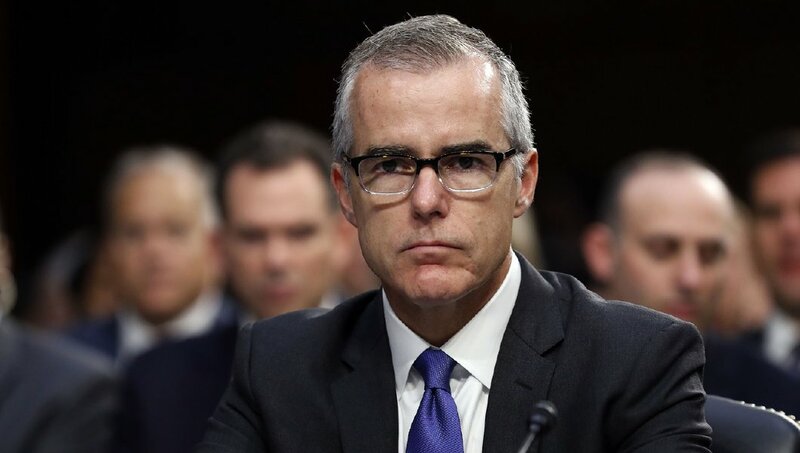 What is also noteworthy is the timing of McCabe’s departure. On Sunday, FBI Director Wray traveled to the White House to read the FISA memo, and on Monday the House Intelligence Committee will vote on whether to release it to the public. He also threatened legal action against House Intel chairman Devin Nunes, R-Calif., if the Republican-led panel votes to release the memo. Not Strzok or Page or McCabe for conspiring against a sitting president. Oh no. That’s perfectly okay. No, it’s Nunes who’s the criminal here, according to the insane Left — the very same people who have been doing all they could to protect master criminal and serial classified intelligence abuser Hillary Clinton (so they could protect her boss, Barack Obama). And all because Nunes believes the American people have every right to know how corrupted their instruments of justice have truly become. As for the memo, if the Intelligence Committee approves its release — which it is permitted to do under the law and under the Constitution — it’s a done deal. The White House has already said the president supports releasing the memo, which he and others feel will not only vindicate his earlier claims of being “wiretapped” by the Obama administration, but that special counsel Robert Mueller’s entire “Russian collusion” investigation is based on a false premise. Let the games begin. It’s time this swamp was finally drained. Read more at Trump.news.